Walter von Geroldseck (1231-1263) - came from a wealthy and distinguished German noble family. March 27, 1260, was elected bishop of Strasbourg. Strasbourg - a city on the Rhine, the historic capital of Alsace on the border of France and Germany. In the Middle Ages the city was an important economic center thanks to a good location at the intersection of roads from Italy to Flanders and from France to Central Europe. The growth of wealth and influence of Strasbourg has led to the upgrading of the city. In 1201, Holy Roman Emperor bestows Strasbourg status of "free city". Free city ruled by Prince-Bishop. They had to organize themselves own protection and support of the emperor during the Crusades. Gradually the power in the city moved to townspeople in the face of the burgomaster and the municipality. In 1260, Walter von Geroldseck demanded return all formerly belonging to the bishop authority. The townspeople refused, and soon the conflict escalated into open armed conflict, later dubbed "the War Walter". Walter with a group of knights blocked the roads leading into the city, devastated the surrounding area and prepared to attack. The army of citizens under the command of the mayor and with the support of Emperor Rudolf Habsburg - came out to meet the knights of the bishop. March 8, 1262 a few kilometers from Strasbourg, Hausbergene opponents met. Before the beginning of the battle occurred joust, after which the soldiers of both sides rushed to battle. Crossbowmen townspeople did not give a foot-soldiers of the bishop together with the knights and, eventually, detachment of the bishop was crushed numerically superior army of citizens. Walter continued to fight even after being under him were killed by two horses. He was defeated, losing 60 knights were killed and 74 captured prisoners. After a temporary ceasefire from July 9, Walter in November was ready to fight again, but lost the support of its allies. Some time later, in February 1263 he died. Buried in Dorlihayme. Strasbourg became the imperial city with extensive self-governance rights, political autonomy, and is directly subordinate to the emperor of the Holy Roman Empire. 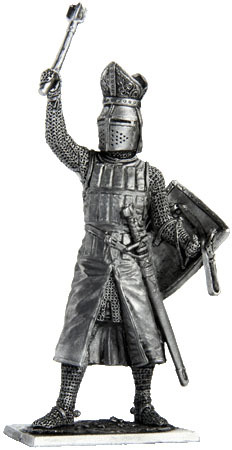 Bishop has protective gear and equipment needed to conduct equestrian knight's battle. Gilded grand slam capped a white bishop with a red miter jointing. Its red with a white fringe syurko inside shot down several rows of vertical plates. Such protective plate can be made from bone, horn, whalebone or metal. In his hand mace with four steel ribs, decussate. Sword sheathed and hanging on a white waist belt, for the biblical adage says: "He who the sword shall perish by the sword. " The shield emblem in Strasbourg: a red sash on a silver (white) field. (family coat of arms kind of background Geroldsek was a red zone on the golden field).